At BBC 6 Music recording ‘A Month Of Matinees’ – to go out Sunday Dec 20th, 15.30-17.30. Simon Pegg is on Dec 6th, then Martin Freeman on Dec 13th, then me, then Bill Nighy on the 27th. Will be fun. I played an extremely eclectic mix of music – Metric, Cornelius, Beck, The Slew, Brendan Canning, Frank Black, Art Brut, Fake Blood, Siriusmo, The Kinks, Lee Hazlewood, Liquid Gold (!) and much, much more. Enjoy it when it’s on. I caught this on Radio 6 last year before Christmas and loved the selections. I did expect some more contemporary sounds, as I noticed in Shaun of the Dead some “Plaid” promo stickers and other Warp memorabilia in Simon Pegg’s room! I’m now wondering if they were placed there by someone else! Still, fantastic show, and a pleasure to listen to! I made myself an oldies CD last night (I will admit I've been a bit harsh with the use of “oldies” for some of the songs). Quite poppy but a great listen to! I didn't realise until after I had burnt it that I had some Lee Hazlewood, The Kinks and Smith in there. w00t w00t, just saw this fab interview!!! i guess they caught you when you were recording this. Lawl, really? Well you should also know I got to meet and actually have a nice conversation with Scott Pilgrim writer Bryan Lee O'malley at this years Comic Con. Dude's pretty chill, just standing by the door minutes before his panel starts, as a staff member I had access to basicaqlly anything. Ahh Comic Con……what was missing again? 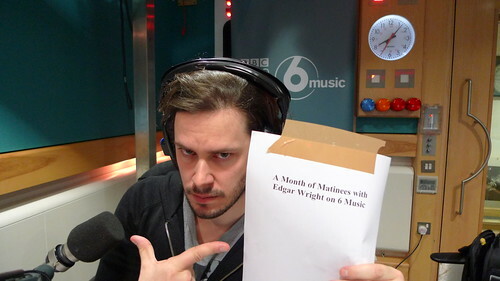 Oh yea…Edgar Wright!! Listened to the Ponyo soundtrack? It's quite beautiful. is there any way i can hear/see it in the states?? Lee & Nancy just hit that spot every time I listen to them. “Some Velvet Morning” usually sneaks onto my CDs. I feel slightly disappointed. Although I wasn't expecting to get The Kinks one right, given they had so many great tracks. Actually I just checked up on all the bands you named. The Kinks were the only one that actually triggered my memory with their song “You really got me goin”. Other than that, nope. At first the Beck I thought you were referring to was a Japanese anime band. Hahaha what a laugh that would've been. you have lived a sheltered life if you've never heard Beck or The Kinks. Finally some one who knows less about the bands you listen to then I do. I at least know who The Kinks and Beck are. And Edgar's Egg Box is back, im guessing your playing Mars by Fake Blood & hoping for Picture Book by the Kinks. I'm with Neil an keeping my fingers crossed for the podcast. Looking forward to this Ed. You played Lee Hazlewood.. any Nancy&Lee? You've never heard of The Kinks or Beck? Never heard of these bands but I'll give em a listen. You got one right. But given that Liquid Gold only had the one hit, that was not too difficult. I read “A Month of Manatees” at least three times before I figured out what this says. Oooh, I'm liking the artists! “Waterloo Sunset”, “The Micro Disneycal World Tour” and “Dance Yourself Dizzy”? Or have I completely misjudged you? What an expression in Knives' eyes! Will definitely try to listen to your playlist online. This is gonna be great. Any ideas whether this will be podcast? Looking good DJ-Ed. Can't wait to hear the show!